Presenters: Thay Dao Quang, Ph.D.; Ms. Anne Marie Rossi*; Margot Hasha, Ph.D., MSW; David Weibel, Ph.D. 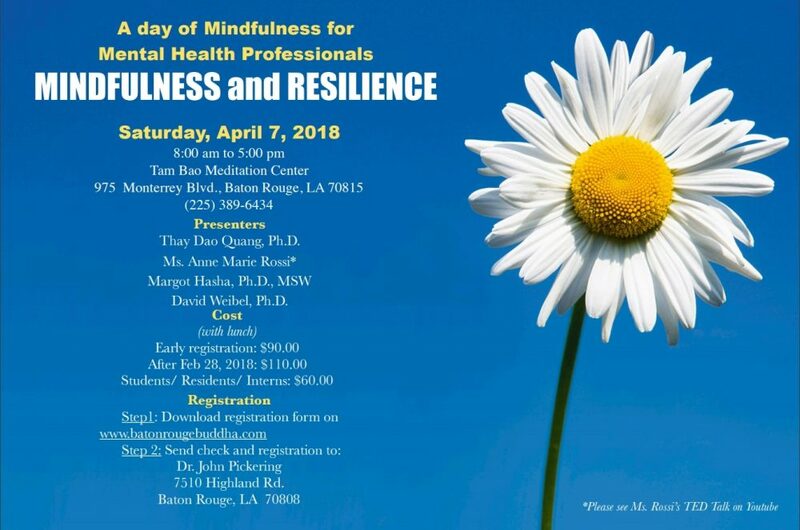 When: Saturday, April 7, 2018; 8:00 A.M. – 5:00 P.M.
Mindfulness, a practice associated with two and a half millennia of Buddhist psychology, has become an increasingly popular concept in psychotherapy and counseling literature over the past three decades, as more and more mental health professionals have become aware of it and incorporated meditation and mindfulness approaches into their personal lives and therapeutic repertoires. Several empirically supported therapies, such as Mindfulness Based Stress Reduction (MBSR), Dialectic Behavioral Therapy (DBT), Acceptance and Commitment Therapy (ACT), and Mindfulness Based Cognitive Therapy (MBCT) have included a significant mindfulness component as part of their therapeutic regimen. Our featured topic this year will be the use of mindfulness and mindfulness-based therapeutic interventions to build and maintain emotional resilience in clients, and to improve coping skills and performance with regard to a variety of life problems and situations. Didactic presentations on these subjects will be alternated with opportunities for guided personal meditation practice to enhance therapeutic awareness and effectiveness. Approval to offer CE credits has been applied for with regard to the following professions: Licensed Professional Counselors; Psychologists; and Social Workers; Certificates of Attendance will be provided for all participants.